As clinicians who come in contact with patients complaining of a wide variety of symptoms every day, you may have worked with victims of narcissistic abuse and not recognized the signs. Victims often don’t know they are suffering from narcissistic abuse and instead reach out for help because they have somatic symptoms. Others feel they are not coping with their own lives and present with multiple psychological issues that are inaccurately diagnosed. They have no idea that a toxic relationship is at the source of their despair. Narcissistic abuse frequently does not look like domestic violence. It is harder to identify because often there are no obvious signs of abuse. The victims may spend years in a vicious cycle of love bombing, isolation and gaslighting, enduring tremendous loss and psychological destruction before they learn the root of their problem. As a clinician, you may be the first person to ever have the opportunity to name and validate the patients’ experiences and get them on the path for help. Narcissistic abuse is growing in recognition among the psychological healing community, with discussion of the term, “narcissistic victim syndrome” used to describe a cluster of trauma symptoms that are caused by living with someone with narcissistic personality traits. In this webinar, you will learn the key pattern of narcissistic abuse, common tactics used in narcissistic abuse, how narcissistic abuse affects victims, and how to recognize the signs of narcissistic abuse in your clients. 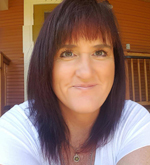 Tiffany Kettermann, LPC, CADCI, MPA, MA, is a licensed professional counselor and a certified drug and alcohol counselor with a private practice, Health Allies Counseling, in Portland, Oregon. “We all have our own unique journeys in life,” she says. “Hurt and pain are an inevitable part of that journey. However, I believe we are built for connection and are not meant to be alone, particularly as we face difficult times. A stable and safe relationship with a trusted counselor can be an important part of a client’s journey, helping him or her to feel supported and to arrive at useful and positive solutions. Ms. Kettermann has a master’s degree in Clinical Mental Health Counseling and a post-graduate certificate in Trauma Response Services from George Fox University. Her training includes working with individuals, groups and families; lifespan development; anxiety and depression; crisis, trauma and abuse; personality disorders; neuropsychology; health psychology; substance abuse; diversity issues; diagnosis and assessment, treatments and interventions. She is a member of the American Counseling Association and the National Coalition Against Domestic Violence. The cost for this course is $49 for two hours of instruction. Once you purchase the course, you can view it as often as you want. There is no expiration date. 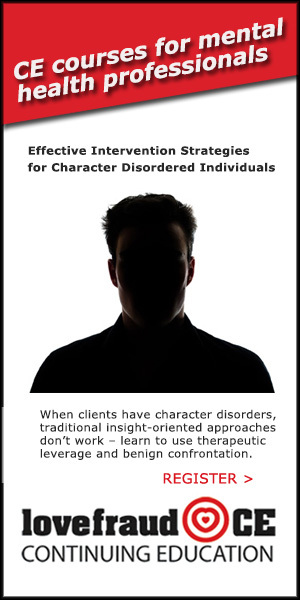 This course offers 2 hours of continuing education credit for psychologists. For more information on credits, click here. What is the pattern of narcissistic abuse? Narcissistic abuse is not the same as domestic violence — but is just as damaging to the victim. Take this course and you’ll learn the cycle of narcissistic abuse, the tactics employed such as love bombing, isolation and gaslighting, and how it all affects the victims.